“Cleanliness is next to Godliness.” A phrase first coined by John Wesley, has since become a mantra related to organization. While businesses should stay away from religious phrasing, they are entitled to presentable, tidy offices and work stations. And, let’s face it, some employees are just better at being clean on the job than others. Some argue that a messy workspace is clear indication of creativity. Regardless of any truth to that claim, at some point the price paid for creativity amounts to costly cleaning fees, gossip, lost paperwork, and judgment. At the end of the day, the productive flow within an organization outweighs the price paid to preserve Disorganized Dennis’s creative spirit. Does a Messy Desk Matter? It can. If a messy desk is affecting an employee’s productivity, it must be documented and followed up with. Management should consider the following questions and findings when deciding if a messy work station should be documented. Yes. 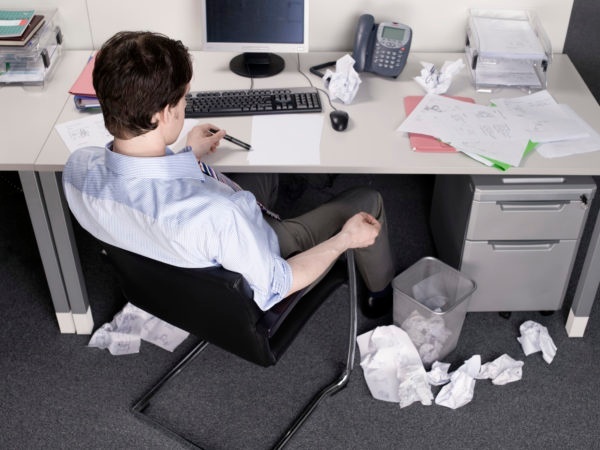 A 2010 Brother International study concluded that messy desks carry a hefty price tag to businesses: $177 billion annually in time lost searching for paperwork. Does It Affect Office Morale? You bet. 57% of workers directly attributed desk organization to productivity levels, with nearly half of respondents claiming to be “appalled” by a teammate’s desk, according to Adecco study findings (courtesy of Forbes). Yikes. Uh-huh. People who work from a messy desk can’t concentrate as much. Likewise, all that extraneous stimuli stifles the brain’s ability to process information, according to a Princeton University study. Does It Affect Data Security? Yup. Confidential documents are easily swiped off a messy desk—and the messy employee might never realize. Well beyond the $122 it costs, on average, to replace one lost document, a stolen confidential document places the organization in an extremely risky situation (PriceWaterHouseCooper findings courtesy of The Paperless Project). Unfiled or unshredded paperwork may also be in violation of a information security program or confidentiality policies. Action must be taken to protect the organization from internal theft or breach of programs and policies. When is a Workstation Too Messy? For managers trying to literally clean up a messy employee’s act, it’s important to document underperformance issues resulting from a messy work station. Of course, if a desk is obviously unsanitary, it needs to be immediately removed, documented, and followed up with. An exterminator’s truck parked outside the office will remove pests and prospective clients alike. Understanding the mess, whether it be from documents or personal clutter, will facilitate the next steps to take. It’s possible that the situation be approached in a creative way (messy desk-offenders aren’t the only creative ones!). Supervisors/managers must document any conversations had and steps taken to remove the litter in case repeat offenses occur. Is the employee seated near an office entry-exit point? The business may be reflected poorly by over-pouring paperwork littering a desk, chair, and floor. Even if he/she is productive, they must remove the clutter to ensure the organization’s visual reputation to visitors. How much paperwork does the employee typically handle? Is there a way where he/she can be emailed more often than printing documents out? Going paperless has many cost-effective benefits while seamlessly clearing a messy desk. If performance appears uncompromised, it may just be offensive to some neat-centric employees. Reseating Cluttered Caroline to another area of the office responds to the complaints and allows Caroline to perform at her own space. If a workstation looks more like a dumped-over toy chest, it’s time to nip it in the bud and ask the employee to remove some, most, or all of their personal accents. Employees should understand how their workstation reflects upon them and their performance. Toys and knick-knacks tend to speak to a more childish behavioral pattern and should be left at home.